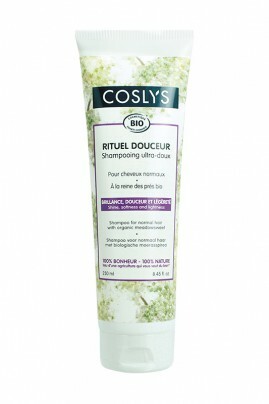 COSLYS Organic Shampoo Ultra-Soft cleans normal hair with its gentle coconut oil-based surfactant. Ideal for daily use, its delicate foam gently washes your hair. Free from sodium lauryl sulfate, it soothes hair scalp thanks to meadowsweet floral water, jojoba oil and honey. Coslys Natural Shampoo leaves your hair visibly healthy, soft to the touch and easy to style ! This Organic Shampoo is so gentle that you can use it everyday ! Apply COSLYS Organic Shampoo on wet hair. Lather then rinse with clear water. Complete hair care by using Coslys Conditioner. Tiens ses promesses, cheveux doux et brillants. L'odeur est légère. Je ne me lave pas les cheveux tous les jours, généralement un jour sur 2 ou 3 me suffit, mais ce shampooing suit mes besoins!